Target: Schick f.a.b. Razors 32¢ each! Target: Schick f.a.b. Razors 32¢ each! Deal Scenario: Buy (3) Schick f.a.b. Razors Price: $7.99 each – $23.97 total Use (2) $4/1 Schick Quattro for Women, Intuition or Hydro Silk Razor or Refill and use Target Cartwheel Mfg. 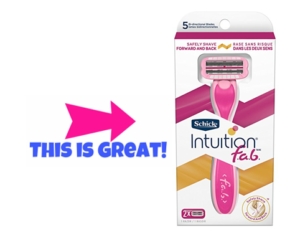 Coupon: $4/1 Schick Women’s Razors Pay out of Pocket: $11.97 + Get a Free $5 Target Gift … Continue reading Target: Schick f.a.b. Razors 32¢ each!